Mick and Di Kershaw are 2 of the stars of the hit TV show GoogleBox noted for their often dry witty comments about the various programs watched, usually delivered while sipping on cocktails. But now the Indigenous art dealers are the latest high profile Oxford Street business people to quit the once Golden Mile. Oxford Street 'To Let' signs seem to pop up overnight. 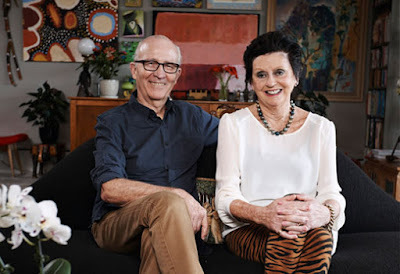 The Kershaws are Australia's top experts in selling & promoting Indigenous art and often acompnay successful artists for exhibitions in cities like Paris and Houston but now they have shut down their large gallery and are continuing to trade on-line. And more seem to be fleeing the area as the popular medico Ben Hanson a favourite of the gay community and arts crowd is moving on from his Oxford Street surgery after 21 years. Last month thousands of protesters took to the streets decrying the lock-out laws that are crucifying inner city nightlife on the gay strip and Kings Cross.